Well made, well priced... this is a good-looking all-rounder that excels when amplified. Add it to your must-try list. Sonic all-rounder. Very useable electro tones. Good quality and great value. Onboard EQs are a little heavy-handed. Simon & Patrick is part of Godin - the largest maker of steel-string guitars in North America. Until this year, Godin's family of brands had never offered an OM, or Orchestra Model, which was conceived by Martin back in the early 1930s. To remedy this, the new 'Concert Hall' OM is now offered in both Simon & Patrick's and Seagull's ranges. Dimensionally, the Songsmith is 380mm wide across its lower bouts, with a scale length of 631mm (24.84 inches). Here in the Songsmith range, it joins the larger cutaway and non-cut dreadnought (396mm wide) and slightly smaller folk, which has a narrower body width, a slightly thicker waist and slightly longer body length. It shares their solid spruce tops, paired with laminated wild cherry back and sides and a silver leaf maple neck with rosewood fingerboard and bridge. "The combination of both treble and the higher-aimed presence really nails a modern zing"
The light, slightly pink-ish wild cherry and the whiter maple are given a mahogany-like colouration, the top a pretty retro three-tone sunburst - all a thin semi-gloss. Edges are cleanly bound with a dark brown plastic, the top having an inner white purfing, while the soundhole has a multi-piece wood rosette. At 43.4mm (1.72 inches) at the nut, with a string spacing of 36.5mm, like all the Simon & Patrick six-strings, it's a shade under Martin's full 44.45mm (1.75-inch) standard - and it's not the most spacious for fingerstyle, hindered by the almost electric-like 53mm string spacing at the saddle. But if this built-for-speed spec is intended, it's certainly matched by the slim-depthed 'D' profile with small/medium gauge, cleanly installed frets. Note the nicely rounded fingerboard edges: an unusual detail at this price. The quality value-for-money vibe continues with a proper Tusq nut and compensated saddle and a decent set of chrome-plated enclosed tuners. 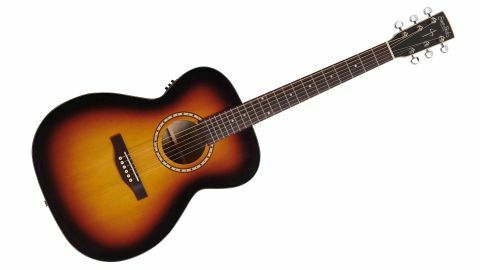 This model is available purely acoustic, at £399, or as here with a B-Band under- saddle pickup and side-mounted A3T (neither has a gigbag). There's a battery box on the base, but the output is via the base jack/ strap button. Sonically, it's a valid all-rounder, with a balanced response. It doesn't have huge projection and does lack a little low-end wallop, and seems like it needs some playing-in time. Amplified, it takes on a different character: a very usable modern-toned electro. The actual onboard EQs are quite dramatic, so be careful - a small turn of the small black knobs has almost too much effect. That said, the combination of both treble and the higher-aimed presence really nails a modern zing.